Translating and refactoring your Excel/VBA models to MATLAB. In the world of Finance, Microsoft Excel is still widely used. For good reason: it allows domain experts without a programming background to develop and test methodologies and models. A significant amount of intellectual property is now in use, developed with spreadsheets. In addition, a lot of legacy models are currently in Excel. However, models developed in spreadsheets are difficult to scale. In addition, as methodologies grow in complexity and size, implementations become increasingly error-prone, as we have observed in multiple customer projects. Therefore, supervisory authorities have grown wary of spreadsheet implementations, in particular the large ones. 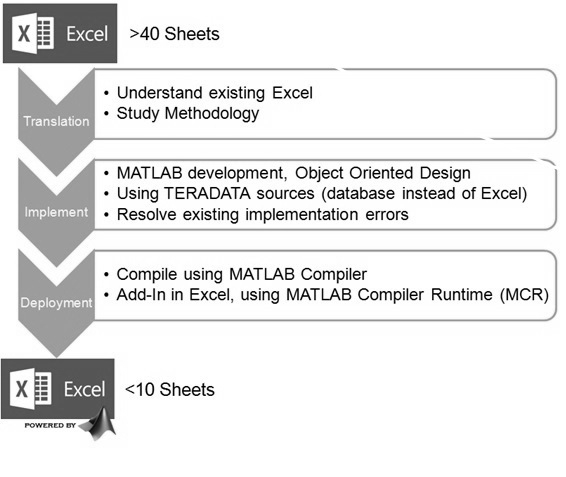 To mitigate this, you may consider to migrate your model implementations to MATLAB. Our approach? First we study spreadsheet implementations and corresponding design documents, then a proper object-oriented design is developed. Finally, coding commences in accordance. The first option allows spreadsheet users to still access the algorithm, just input and output worksheets remain. Instead of forcing users out of their tools of preference, a professionalized version is made available in their working environment. In case you decide to move away from spreadsheets altogether, the other options apply. In case you pursue a dedicated application for migrated models, consider our Framework Application Solutions. We can assist with developing a migration plan, selecting the proper deployment option and perform the actual migration. Hereunder, a schematic representation is shown of a migration project we performed recently, creating an Excel Add-in for a large credit risk related model.